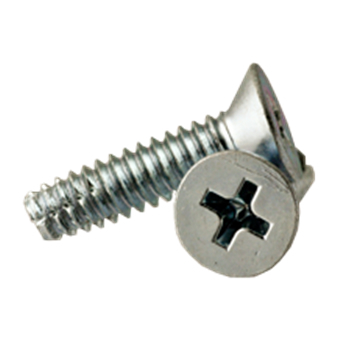 Thread Cutting Screws are blunt point fasteners or screws with tapping or machine screw threads. They are used in many different applications ranging from plastics to sheet metal fastening. Type F thread cutting screws have a machine screw thread pitch, blunt point, tapered entering threads and multiple cutting edges. Type F thread cutting screws are also called "floorboard" screws because they are specifically designed to install wood floors into truck trailers. Type 23 thread cutting screws also have a machine screw thread pitch, blunt point, tapered entering threads, a single wide cutting edge, and a chip cavity. These thread cutting screws are well suited for cast iron and zinc, aluminum die castings, and plastics. The type 23 design provides excellent chip clearing with minimum tightening torques. Type 25 thread cutting screws have spaced threads, a blunt point, tapered entering threads, a single wide cutting edge, and a chip cavity. This design is for molded or through holes in plastics or other soft materials. Provides excellent chip clearing capability.